We have quite a celebration planned this Sunday. We will be closing a tremendous show. Our Midsummer Night's Dream: The Scavengers will perform for the last time at Inwood Hill Park. Afterward we'll perform a great ritual in the world of theatre: The Cast Party. This particular event, for this particular play, will be a difficult one. It is rare to have experienced what I believe this cast did--a collaboration of perfectly combined actors, a synergy beyond that one normally feels, even with the best of casts. Our reviewers have been incredibly zealous in their praise, and our audience have posted laudatory comments all over their and our Facebook walls. It's that good of a show. Biased or no, I'll stand behind that statement 100%. In spite of the varied levels of experience on stage, the obvious truth is that there is so much talent up there it's humbling. At least, it always has been for me. There were times during our rehearsal period when I was thankful I had plenty of experience behind me, because this was a cast deserving of a knowledgeable leader. It was a joy to educate, guide, and be inspired further by this group of individuals. Imagine, if you are an actor, that you've been told to come to callbacks memorized and wearing clothing you don't plan to ever wear again. And then imagine being that actor, arriving with folks you don't know, being taught how to safely beat the crap out of each other and roll all over the dirty ground, and then told, "Aaaand....Go." Over and over and over again. Or that you are handed a script, assigned some roles, and then told you have 10 minutes to show this scene, and hey, use the park's tree leavings and such as your props. Good luck, see you in 10. Now imagine you are the director, staring at folks who are already good enough--and pretty much ready--to open the damn show. All before it's even cast. But that's not what's hard to say goodbye to. And the thing is, I truthfully already had to say goodbye before we opened. Three weeks of rehearsals were what I really had to let go of. Actors who for the first week, took to the words of my adapted script and the language exercises and analysis, sitting on their butts; then for two weeks, tumbling around in the dirt and grass of several parks every single humid day; then for the final week, fairies meet and remember lovers who meet and remember mechanicals--14 people newly re-introduced, but this time with a whole lotta imagination behind them, to execute and show off and bring together. Oh, and then to add in "the forgotten scenes"--those moments here and there, large and small, which needed all the actors at once and were only visited and created 2-3 days before opening. THAT'S what I found hardest to say goodbye to. I was singing on my way to rehearsals every single day. My step was light, my laughter easy. And I had to let go of 3 hours spent every day this summer, directing pure magic. So I think I always knew we had a great show. Better yet, I suspected and found out we had an amazing ensemble. When you know who you want to cast, but can't decide where to put them because they'd each be brilliant in 2-3 different roles.....well, that's a freakin' FABulous problem to have. 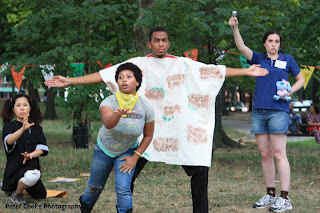 Our lovers are certified combatants; and how often I've heard from folks that it's the best "lover's scene" they've ever seen in any Midsummer shows you how dynamic these actors (Angela Sharp, Alex Gould, Brandi Bravo & Andrew Sanford) are, especially with the choreography of Rocio Mendez. I mean come on, when you have a badass fighter like her allowed free reign, you're gonna see some pretty cool stuff. Our fairies (yes, yes, they're pretty close to naked--and in perfect shape) do their own brand of tumbling and magic...nobody can take their eyes off of this Puck because she's mesmerizing; and I swear if my Oberon adds one more back-handspring-flippy-twisty-aerial-impressive acrobatic move to the sequence we already have in there, I'm just going to have a heart attack for his safety. But, of course, it's all in regular stride and easy as pie for that guy--whose acting moments also deepen with each show. These mechanicals have forever endeared themselves to me. A motli-er crew you've never seen, and the interrelationships are fabulous, funny, and truly inventive. I daresay I've never seen a better Quince, and our Bottom is always one of our audience members' favorites in the show, and our Flute brings out some of the audience's heartiest laughter. But I think the truth is, it's hard for me to decide if our very stout Snout is my favorite, with his sporadic glimpses of frivolity; or our wide-eyed Snug, esp once she dons the cutest Lion's mask I swear I've ever seen. And I have a particular fondness for our Starveling, who in her simplicity has created the most memorable Moonshine I believe I'll ever experience--complete with an adorable hop on her final exit. So, this will be a bittersweet closing for me--and I suspect for all of these actors as well. Oh, sure, we all have our next projects lined up and ready to plunge straight into; but if we are honest with ourselves, we can admit that while we are always looking forward, this will have been an experience we'll always look back on and wish we could relive even just one of the many priceless, honest, unforgettable moments we created together. And so I say "Amantrya" to this cast I love so well, bidding them farewell...if only for a short time. Because now these folks are high on the Curious Frog's list! Now that spring is here I find myself dining outdoors with friends quite often. Why, just the other day I found myself catching up with a friend while having brunch al fresco. I was telling him about my experience so far working on this French play called The Maids and he gave a little laugh. I asked "what’s so funny?" and he mentioned how Genet was an interesting playwright. Yes, as anyone who knows Genet’s works will attest to...but that got me thinking about how interesting this particular production actually is. When you think of this classic French play written by Jean Genet, the team I'm working with is not the one that comes to mind. I think what makes this production of The Maids so different from some of the works we often see in the city is that it’s not about the people themselves, but rather about the characters and script. You have two actresses cast as sisters who look nothing alike, but you wouldn’t know that in rehearsals, an exquisite Madame who is in fact a man, and this drama is all coming together under the skilled direction of a woman with great comedic timing. This is a multicultural and female-dominated production, which is what makes it so exciting. Now this is my first time working on a Curious Frog production, and the company’s mission of hiring people in roles that you wouldn’t normally hire them in is to be applauded. I myself am half Asian and you really have to go deep into the team’s bench to find someone who is a Caucasian male. Nothing against Caucasians or males, I myself am half and all male, but it’s interesting because we’re all minorities, and that’s not the relevant thing to the production. In rehearsals we’re constantly working on the minds of the characters and on the workings of the play. Yes, we’ve seen men in women's clothing and unfortunately time and again minorities as maids, but as French sister maids who dress up as their Madame in order to perform a ceremony in their attempt to overcome oppression? I think not! It adds more layers to these already interesting characters. I will say as the assistant director of this production I’ve been put into the rare position of learning more about the female mind due to often being the lone male in the room. Now that isn’t necessarily a bad thing, but it does make for some interesting rehearsals. Just the other evening I listened in on a discussion about the milkman which turned into which hunky male celebrity he was in their minds. Even though the team is diverse culturally it seemed clear that all the ladies could agree on the hotness of George Clooney. So that little laugh that my friend gave about the interesting-ness of the playwright is just a smidgen of how interesting seeing the show will be. This is a unique team putting together a production of a very interesting play from a very interesting playwright making the performances of The Maids not to be missed. Curious Frog Theatre Company's production of "The Maids" opens April 24th and runs through May 8th in a loft in Chelsea, 7:30pm curtain Wed-Sun. www.curiousfrog.org to learn more about the production. Tickets sold through Brown Paper Tickets.